Back in July, I received an email from Kate McCulley, better known as Adventurous Kate. She was replying to an email I’d sent, and in it she mentioned an event she and a group of other experienced bloggers were running in September. They were offering a group of new bloggers the chance to stay with them in a villa in Spain and pick their brains on everything blogging. 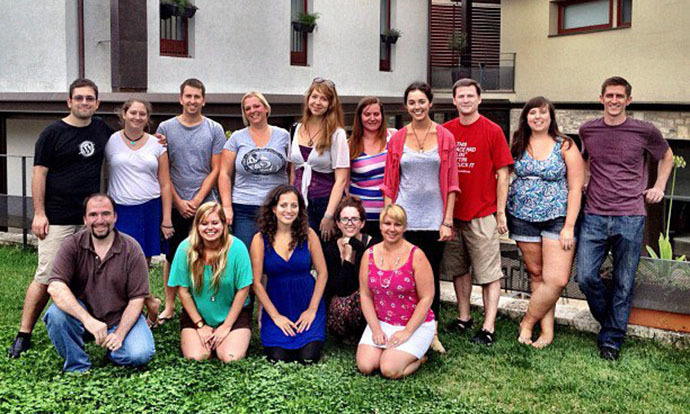 It was an amazing opportunity with one glaring pitfall: I was in Argentina and it was in Europe. I initially just thought no, but the idea wouldn’t leave my mind. If I went to the blog house, I could go to TBU beforehand and TBEX after. It would be a fantastic learning and networking opportunity. However, if I was to go, I had to book my flight before I would know if I’d been accepted into the house. In the end, I decided to risk it and, with some inventive flight changes and help from Flightfox (the ninjas of the flight world), I managed to get a good deal. As it turned out, TBU and TBEX would have been worth the journey alone. I was inspired by the people I met and also learned a lot about what blogging means to me. Best of all, I made a whole host of new friends. The lessons from those three weeks will take a while to percolate, but I know 100% that it was the right thing to do. Within that time, the blog house was the icing on the cake — a two-day personalised experience with one-on-one help from some of the most successful bloggers in the industry. They ran informal sessions and offered individual feedback on our sites, as well as introducing us to some PR people who came as special guests on the second night. One of the highlights was the people, and I wanted to take this opportunity to introduce you to them. I’ve been following Steph’s blog for ages so it was a pleasure to meet her in person. She is a master of writing engaging, personal stories, and offered some great writing and freelancing tips. If you haven’t read her blog, I suggest heading there now. On day two of the blog house, when the internet stopped working, kindly Mike became known as ‘the genius’ as he managed to get each and every computer working. He was an invaluable source of WordPress knowledge and got my site working faster in no time. 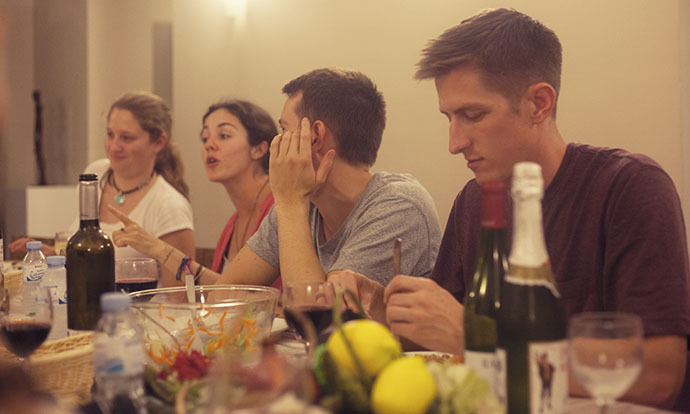 His site is an excellent resource for all the backpackers of the world. The whole blog house idea was born of Michael who sourced our amazing villa in Besalu. With a sharp business mind, he is a fountain of knowledge on how to make money, and already prompted me to think twice about some of my plans for the Vegetarian Travel Guide. He is also a master of Facebook and imparted a wealth of valuable knowledge. 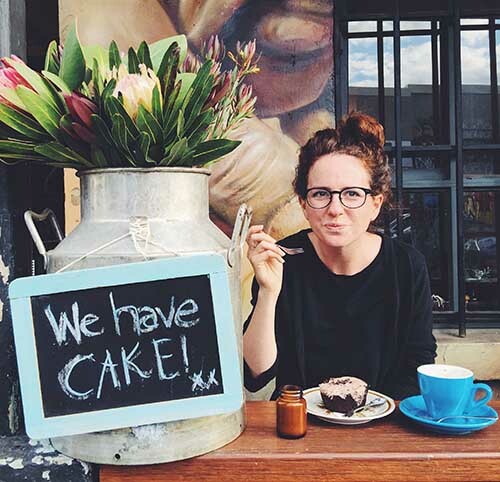 Kate is queen of the solo female traveller niche and has her branding down to a tee. She was a fantastic source of knowledge on PR and marketing and has already spurred me to be more confident in working with the industry. Her iPhone photography is brilliant. Bubbly Caillin originally worked in the film industry before moving into the blogging world and now spans both disciplines. She even has her own travel TV show. Caillin’s site Taste of Travel has some great food photography and I was able to pick up some useful tips from her. She also gave lots of film advice but I stepped back from that, preferring to leave it in Steve’s hands. Previously blogging at Thirty-One Distant, Flora has now re-branded as Flora the Explorer. She became a great friend during my three weeks in Europe and I can’t wait to see how her blog develops. Flora is a great writer and is heading to Ecuador in February. Kiwi Cole’s down-to-earth presence was a pleasure to be around during the blog house. He blogs at Four Jandals with his girlfriend Adela who, like Steve, couldn’t come to the conferences and blog house. Their blog is already going from strength to strength and I can only see it growing. Liz helped me pop my Instagram cherry and was a joy to be around with her giggly presence. She has just returned to America after nearly four years in Spain – her second home. Her next adventure is hopefully to New Zealand. Fellow vegetarian Naomi is from California but has spent the past year in Korea teaching English. She is incredibly well travelled and has a great open-minded approach to life. Her blog specialises in photography and, although new now, promises to be something great. At 23, Emma was the youngest blogger in the house and a champion drinker to boot. I shared a room with her and enjoyed listening to her broad and awesome Scottish accent. Emma’s blog charts her travels with a specific focus on cruises. Erin already has a successful travel blog with one of the most fun niches yet – Disney travel! She even has a global season pass to all Disney destinations. Now, her and Brett have started a food blog Our Tasty Travels where they share their expert knowledge and experiences eating their way round the world. Jennifer blogs with her husband Tim who is in the army. They write about their travels around the world and recently won the award for best new blog at the TBU travel bloggy awards. Ed is a professional pilot and part-time blogger specialising in photography. It turns out he started flying very young, explaining his success at such a young age. His job obviously allows him to travel widely and take advantage of all those photo opportunities and put his skills to use. His photos are gorgeous. 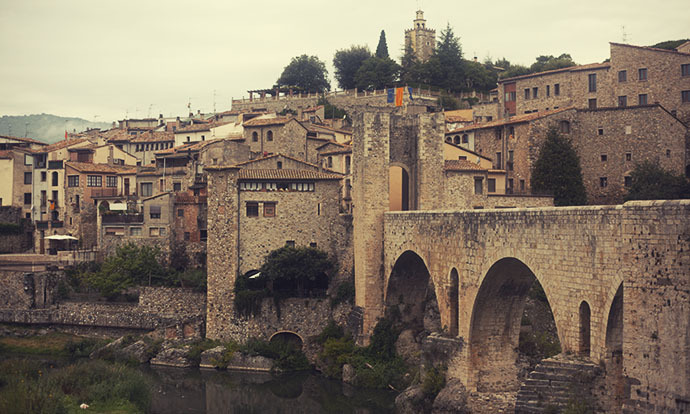 The blog house was held in Besalu, which is one of the most charming towns I have ever visited. We stayed in the mega Casa Marcial, which can be rented through Charming Villas. It has 12 bedrooms, lots of common areas and the remains of a medieval church on the grounds! We felt like royalty. We were also treated to some of the best pan catalan I have ever tasted at Ribera Bistro, and an awesome evening meal at Pont Vell. Both have views of the bridge and I’d definitely recommend them if you’re in town. They’re an excellent bunch. And yes, it was definitely worth it! So glad to hear you had a good time at the blog house, you have a great site but these bloggers are definitely great ones to learn from. Sounds great! And thanks to your links I’ve got some fantastic new bloggers to tune in to – thanks! What a good looking crew! 🙂 Sounds like it was a really great time. Indeed! Hopefully I’ll get to meet you too soon. Hope the percolating is going well! Sounds like you had a great experience! It was great meeting you at the ‘house! What a cool experience. I can’t imagine what it would be like to spend so much time with all those bloggers!